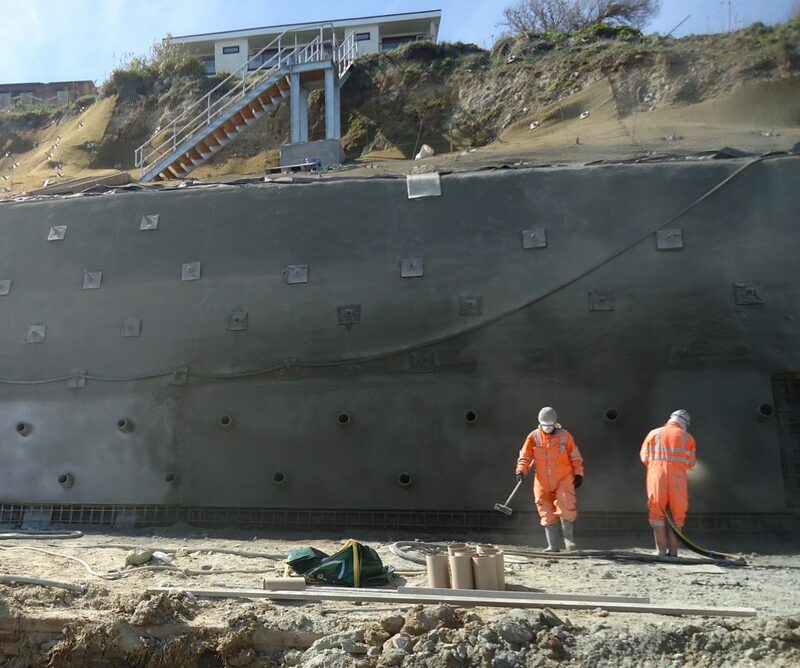 The project required a reinforced concrete solution to protect a cliff face slope against tidal erosion, beneath the Pines Hotel in Swanage Dorset. Following excavation and soil nail installation, BAM Ritchies fixed vertical strips of drainage membrane at 2m centres, followed by 2 layers of A393 weldmesh. A single layer of approximately 175mm of accelerated sprayed concrete was then applied to the prepared face. 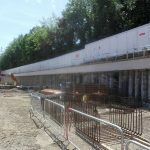 The ground excavations were undertaken in 2.5m high sections to facilitate the dimensions of the weldmesh, thereby minimising mesh waste on site. 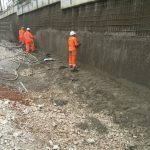 The original design detail showed soil nailing being undertaken prior to the sprayed concrete overlay, but after discussions between the regional offices it was decided to install the soil nails after spraying. This revised method removed the difficulties that placing 2 layers of mesh over the soil nail heads would have posed. To facilitate the soil nail drilling 200mm diameter pipes were installed prior to the sprayed concrete application, at the required centres. These pipes enabled the drilling operations to be undertaken without damage to the sprayed concrete lining. A total of approximately 400 m2 of slope was stabilised over a 6 week programme.